We’d like to introduce Michaela, a Houzz contributor, an interior photographer, decorator, and occasional DIY blogger behind House Over Head. If you follow Michaela’s blog then you will instantly fall in love with her knack for creating beautiful spaces. 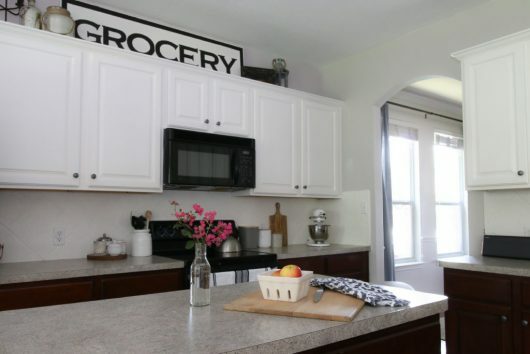 Michaela has been working on a budget friendly kitchen makeover. She scoured the web for kitchen inspiration and finally landed on this space because she felt it was achievable through budget friendly projects. 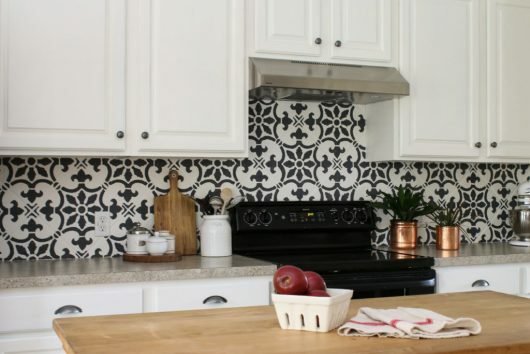 Since cement tile was not in her budget, Michaela searched for more affordable options. 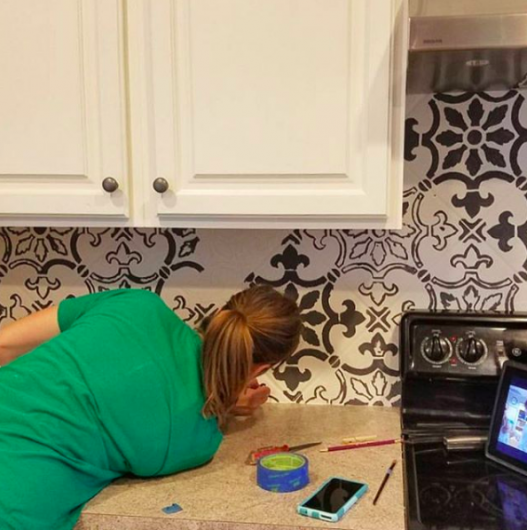 She said, “I read around online and saw that some people were using stencils and paint to achieve the high-drama look of cement tile.” Tile stencils are an easy and inexpensive way to update a space. 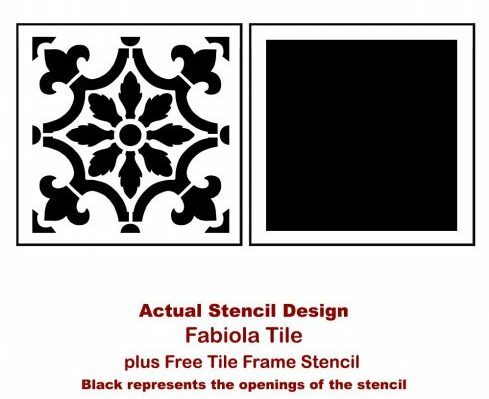 Michaela browsed our website and selected the Fabiola Tile Stencil Pattern. This tile pattern is based on traditional Portuguese Azulejos tile designs and is suitable for all types of DIY projects. Michaela used blue painter’s tape to hold the tile stencil in place. Because she was working on a textured surface, she found it easier to trace the stencil design with a pencil and then fill it in with paint. She painted the tile pattern using DecoArt Chalk Paint in Relic. You could also use a dense foam roller or a stencil brush but make sure there is very little paint on your painting tool to eliminate bleed. After each section of the stencil is complete, simply untape it and reposition to finish the pattern on the backsplash . For more information on how to stencil, please check out our stencil tutorials. Let’s get to the fun reveal! Are you ready to see how this kitchen backsplash turned out? 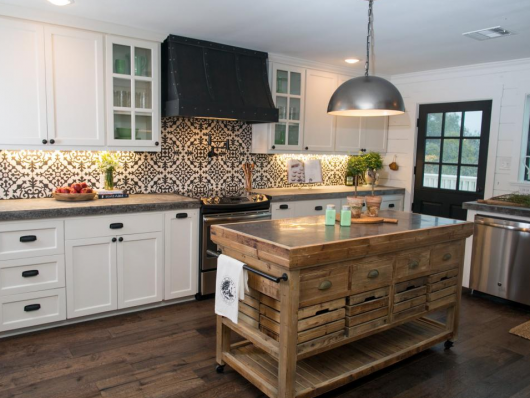 Here is Michaela’s new kitchen featuring a stenciled tile backsplash. For more amazing DIY projects and inspirational home decorating tips, be sure to visit House Over Head. 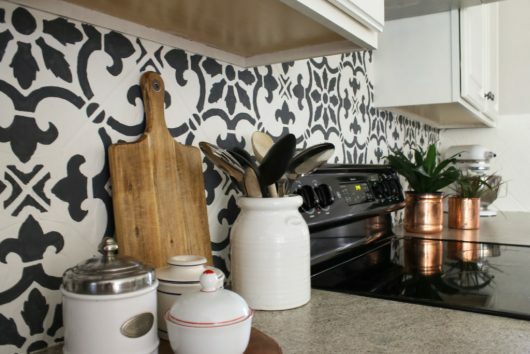 Tell us, what tile stencil pattern would you use on your kitchen backsplash? Leave us your thoughts in the comments below! Perk Up Your Space with Paint & Stencils! Stencils Make Old Furniture Wow-Worthy!